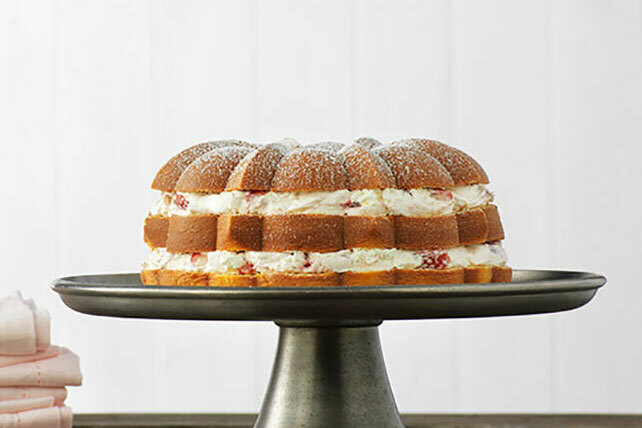 Discover layer upon layer of yum with our Strawberry Cream Filling Cake. Our Strawberry Cream Filling Cake requires only a few simple steps to complete. Prepare cake batter as directed on package. Add dry pudding mix and milk; beat 2 min. Pour into greased and floured 12-cup fluted tube pan and bake as directed on package. Cool in pan 10 min. Loosen cake from sides of pan with knife. Invert onto wire rack; gently remove pan. Cool cake completely. Beat cream cheese in large bowl with mixer until creamy. Reserve 1/2 tsp. sugar for garnish. Add remaining sugar to cream cheese; beat until blended. Gently stir in COOL WHIP. Stir in strawberries. Cut cake into 3 layers. Stack layers on plate, spreading cream cheese mixture between layers. Sift reserved sugar over cake. Refrigerate 2 hours. Garnish with whole strawberries before serving. Dessert can be a part of a balanced diet, but remember to keep tabs on portions.